Pinterest, the online pin board where users can share things they like from around the web has enjoyed rapid growth since its launch in 2010. Right now it is growing faster than Facebook and twitter were at the same time of their lifespan. The sign up process of any website is crucial to its success or failure and the Pinterest sign up process is super easy, beta invite requirement aside. Sign up is all about a users motivation to access the service that is behind the form. If you can get your potential users highly motivated to use your service, then the form should become almost irrelevant. However, that doesn’t mean designers of web forms should become lazy just because they have a killer service offering. 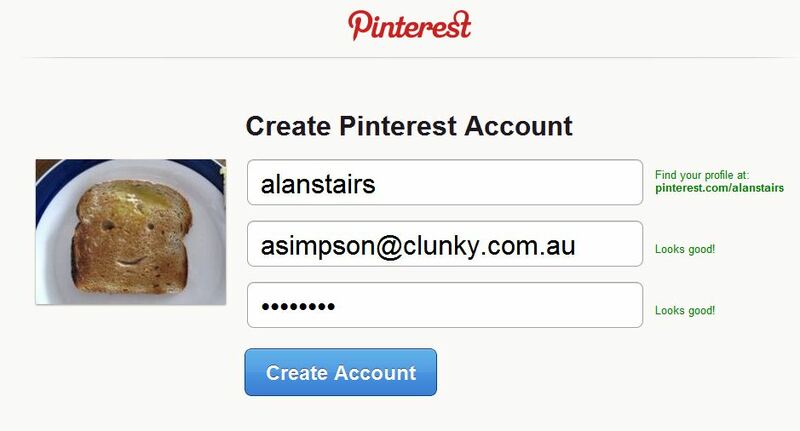 Pinterest uses Facebook as a third-party login procedure to sign up. Given its target market is predominantly in the 18 – 40 age bracket, this is not a barrier, but rather makes the whole sign up process even easier and allows users to easily share pins via the popular social network and increasing its brand awareness. Where Pinterest does require information from the user, they give excellent feedback on each input field with simple, clear messages in green font next to each field. Once the generic account has been created Pinterest now needs to know a little about you to get you started with the service. The form is easily split into 3 steps, 1. People, 2. Pinboards, 3. Button. This gives the user an understanding of how many steps there are to complete rather than leave them guessing. 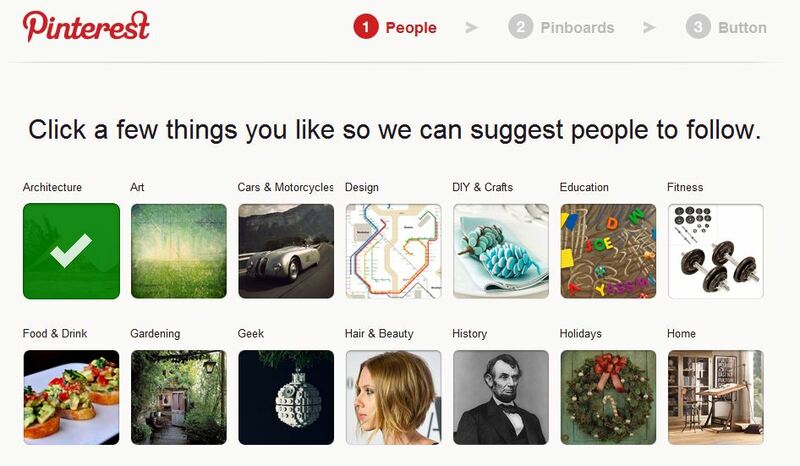 Rather than dump the user directly into an overwhelming array of pinboards, Pinterest needs to understand the types of things they might be interested in so they can display relevant content and people for them to follow. Rather than just asking users to list things they like (Who likes filling in a long form?! ), Pinterest give them easy to distinguish images and labels to simply select. This process is visually appealing (like Pinterest itself), takes less time than a traditional form to fill out and crucially Pinterest is more likely to get quality information from this technique to help personalise the service to the user and get them hooked early on. This data acquisition method mimics the ilike music service sign up process that was acquired by MySpace and used images of bands to easily acquire data from users. The use of large green ticks as clear visual feedback makes it obvious to users that their selections have been recorded. 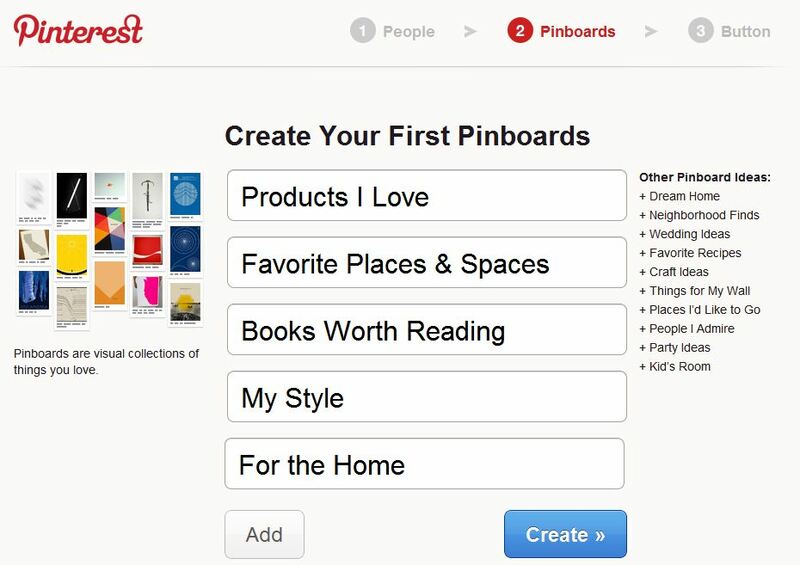 Step 2 asks users to create their first pinboards. Rather than starting with a blank canvass Pinterest suggests standard pinboard topics, which fit with the types of products their target demographic is likely to be interested in. 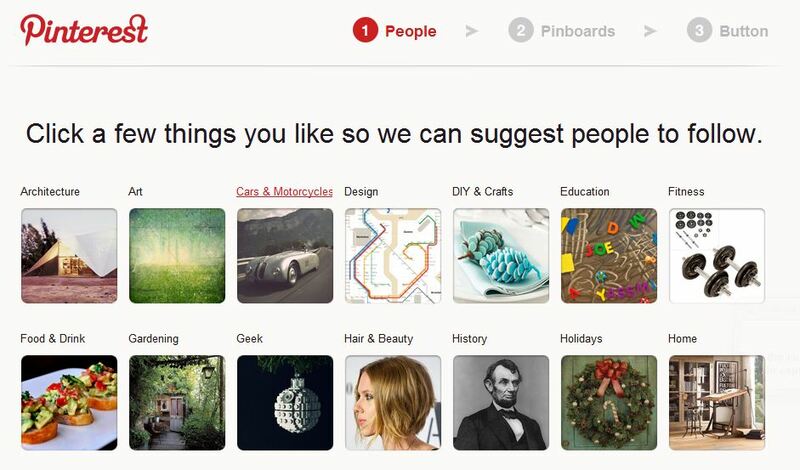 Pinterest provides inline help, with a brief description of what pinboards are; “Pinboards are visual collections of things you love”, and some inspiration for suggested pinboard ideas on the right hand side of the form. These inline explanations and hints ensure that a new user is not left guessing about what they need to do at this step and keeps them moving through the form with ease. This is progressive disclosure (“only providing enough detail as needed at the moment and providing more when the context necessitates it” Joshua Porter) at work. Users can at this point create new pinboards if they like, but they do not have to which is crucial in not overwhelming the user at this early stage of the sign up process and ensures new users do not have a blank profile after signing up to the service (Another key reason many social apps fail). Once a user is confident using the service and is hooked, they are more likely to start creating and pinning to new pinboards. The primary action on this section of the form is “Create”, this is visually distinguished from the secondary action “Add” using colour and size. This leaves the user in no doubt as to how to progress through the form quickly. 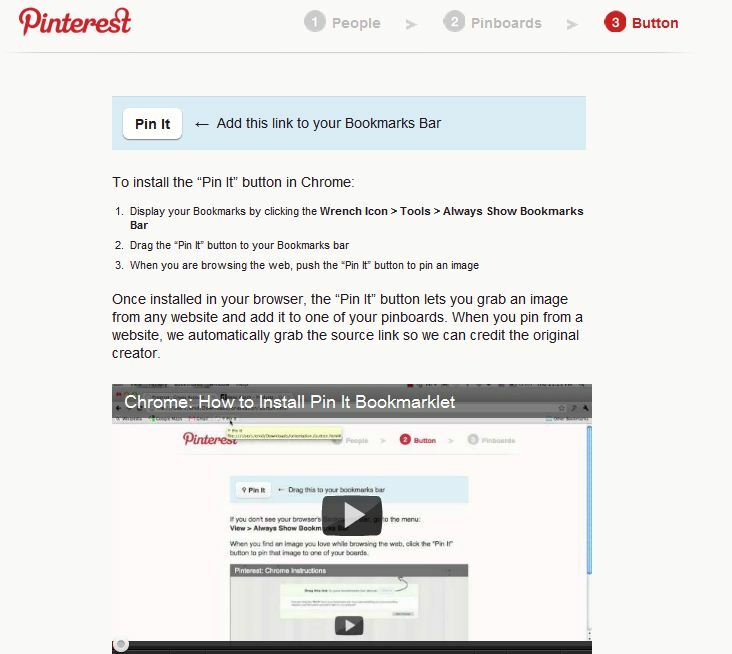 At the last stage Pinterest requires users to add the Pinterest bookmarklet to your browser. This is potentially tricky, but they include a short video explanation, tailored to the browser you are using with clearly numbered steps to help users complete the installation. Pinterest successfully uses best practise sign up and web form design elements to make the process easy for new users. Clever data capture techniques up front allow them to personalise content once users have completed the sign up process.